– Michael Burgis, Esq. Managing Attorney. Zhenia Burgis graduated with honors with a B.S. in Business Administration from the Marshall School of Business, University of Southern California (USC). 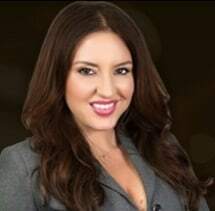 In May of 2008, Mrs. Burgis graduated in the top 20% of her class from Southwestern University School of Law, where she was a member of the Southwestern Law Review and received CALI awards in Legal Research & Writing. Mrs. Burgis became licensed to practice law in December of 2008. From 2008 to 2013, Mrs. Burgis primarily devoted her practice to defending labor and employment related matters in both the public and private sectors. In April of 2013, Mrs. Burgis joined Michael Burgis & Associates to chair the firm’s Labor and Employment Division. Mrs. Burgis brings the insight and experience of employment defense strategy to the Plaintiff’s side, applying her knowledge and expertise to effectively represent employees who have been subjected to unlawful employment practices, including harassment, discrimination, retaliation and wrongful termination. Mrs. Burgis has extensive motion, deposition and courtroom experience; she takes an aggressive approach to litigation to obtain the maximum results for her clients. Mrs. Burgis is also fluent in Russian and semi-fluent in Spanish.